Sure, PulteGroup's most recent results showed signs that the housing slowdown won't be that bad, but they weren't great, either. You can tell that the market has a dour outlook on homebuilders when PulteGroup (NYSE:PHM) reported just a 1% increase in new orders year over year, yet the stock jumped more than 7% the day earnings were released. What's even more peculiar about the stock bump was that PulteGroup didn't even beat earnings expectations. It's hard to see what had Wall Street excited about this most recent earnings report, so let's go digging through the numbers to see why investors were so excited about Pulte's results. DATA SOURCE: PULTEGROUP EARNINGS RELEASE. EPS = EARNINGS PER SHARE. Something to keep in mind when looking at a homebuilder's results is that revenue and earnings are much more a reflection of what happened a few months ago when the order for that home was booked. This past quarter, Pulte revenue was up on higher closings and a modest uptick in average home sale price, which led to a 26% increase in revenue year over year. The company also benefited from better year-over-year margins. Data source: PulteGroup. Chart by author. One promising thing was a 1% increase in net new orders compared to this time last year. It doesn't sound like much, but in the second quarter Pulte's net new orders were down 1% year over year and indicated a slowdown. It's also worth noting that net new orders were down 15.6% compared to the second quarter, but some of that can be chalked up to seasonal trends in homebuying. At the same time, though, there were some things that suggest it's getting harder to get those new orders. Selling, general, and administrative costs as a percentage of revenue increased 60 basis points compared to the prior quarter, to 9.8% of revenue, and management noted that the conversion rate (new orders over potential buyer traffic into its communities) was down considerably. On the company's conference call, CEO Ryan Marshall noted some of the challenges PulteGroup has seen over the past quarter related to sales. Buyer traffic into our communities in Q3 was up 15% over last year. And the year-over-year gains accelerated as we moved through the quarter. To us, the increasing volume of consumer traffic indicates that the home buying interest remains high. While traffic into our communities was up in the quarter, companywide absorption pace was down. You can read a full transcript of PulteGroup's most recent conference call here. As much as investors want to celebrate PulteGroup's results, this reaction seems a bit much. Other homebuilders put up similar numbers when they reported this past quarter, but the market didn't dole out such reverence for them. What PulteGroup did better than others was to preserve its margins and improve its balance sheet. Those are good qualities to have as the housing market slows down, but it's not really an investment thesis-changing kind of event. The next few quarters are going to be a fascinating time for homebuyers. As Marshall noted with his comments about traffic, demand for homes is still high. Rising interest rates and high home prices are making it harder to convert those prospective buyers into new orders, though. 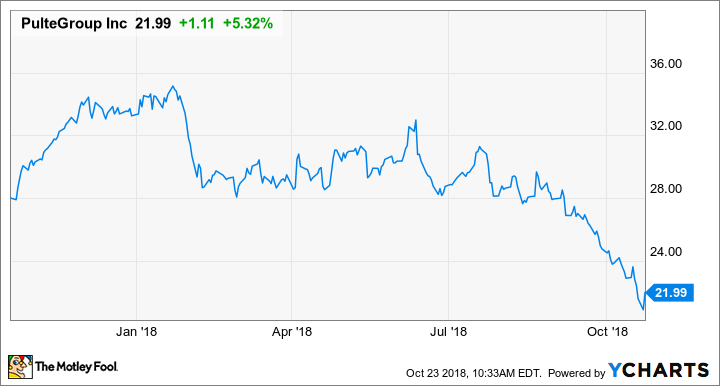 Despite the fact that PulteGroup is trading at 8.7 times earnings and most of its peers are also trading for dirt-cheap valuations that make them attractive investments, investors should be prepared for these stocks to decline even more in the coming months.